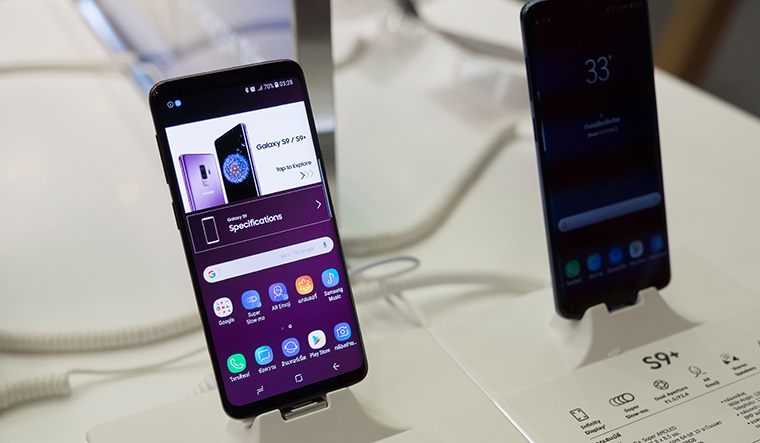 The Galaxy S9, the latest flagship device from Samsung, has received accolades globally. Some have even termed it as an iPhone X killer. We give you a first-hand experience of the Galaxy S9, which was launched in India earlier this month. Samsung launched the phone in four new colours—coral blue, midnight black, lilac purple and titanium grey. The one we got was coral blue. Along with the phone, the pack contained a transparent silicon case, earphones and an hi-speed charger. One of the best features of the Samsung Galaxy S9 is its sound quality. The ultra HQ audio playback ensures that you get good sound, without a painful bass or any loss on treble. The hi-speed turbo charger powered the phone to 50 per cent in around 33 minutes and, in a little over 80 minutes, to 100 per cent. Also, the 4GB of RAM processor adds speed to your tasks. Under normal usage, the phone’s battery (3,000mAh) lasts for about 18 to 19 hours. But, during usage with Wi-Fi—extensive video calling and gaming—the battery lasts for about seven to eight hours. Good, but we expected better for a high-end phone. This phone is all about colours, and you realise it as soon as the screen turns on. The curved screen is the one to fall in love with. The S9 has a 5.8inch quad HD plus super AMOLED screen, which covers 570 pixels per inch, and is slightly better than the Galaxy S9+, which is a bit more expensive. The screen features infinity-display or near bezel-less display. While the default resolution on the phone is full HD, it can be changed to quad HD in settings. The better quality display, of course, eats into the battery time of the phone, though with no significant reductions. The camera is a 12MP shooter, powered with a super-speed, dual pixel, autofocus sensor. It has a number of customisations—full-manual or hybrid setting—to suit different light conditions for a selfie shot. The picture quality is great, thanks to the dual focus feature. Depth and colour temperatures are at their natural best. The camera and the screen of Galaxy S9 are better than what is available on the iPhone X. Optical image stabilisation is available for still photo and video shooting, and it yields better results—shake-free photos and videos. We also liked the selective focus (or background blur effect). Videos can be shot at all resolutions, starting from 720pHD to full quad HD. Face detection and face-unlocking features in the phone work glitch free. The Bixby personal assistant is a super cool feature in the device that allows you to wake the phone and do tasks for you, with voice commands. One of the best features of the Samsung Galaxy S9 is its sound quality. The ultra HQ audio playback ensures that you get good sound, without a painful bass or any loss on treble. Sound clarity, even without earphones, is excellent. The recording features of the inbuilt recorder are great. Various settings allow you to record in an interview mode in a noisy hall or even from close quarters. The Galaxy S9 has 64GB internal storage, and an additional memory—of up to 128GB—can be added using the hybrid SIM and memory slot. We particularly liked the enhanced security features in the phone. The pre-installed knox security package in the phone and its in-built anti-virus and browsing scans ensure you are risk free. Samsung could improve the battery size in the phone, especially when phones a fifth of its cost come equipped with 5,000mAh batteries. The Samsung Galaxy S9 is launched at Rs 62,500 in India, and at its present discounted online price of Rs 57,000, we recommend that you grab one, if you get one.